It has been very quiet across the bulk of the Midwest the past couple weeks. This tranquility may change as we head into the weekend for some. An area of low pressure will emerge out from the Rockies Saturday and crawl through the middle of the country and up the east coast. With moisture to tap into from the Gulf of Mexico, this has the potential to drop 4"+ across parts of the shaded area on the map. 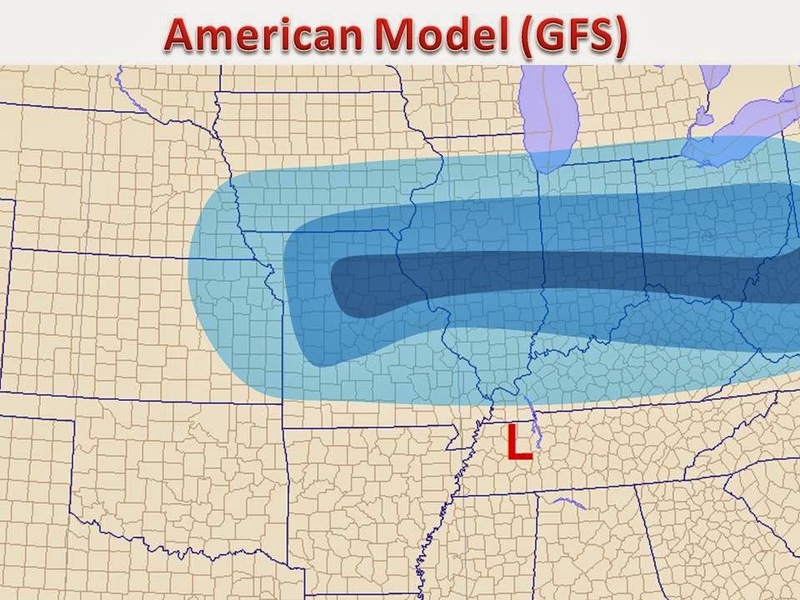 The latest snow forecasts from the major models can always be found on our site, Click Here! Let's dive into the models. 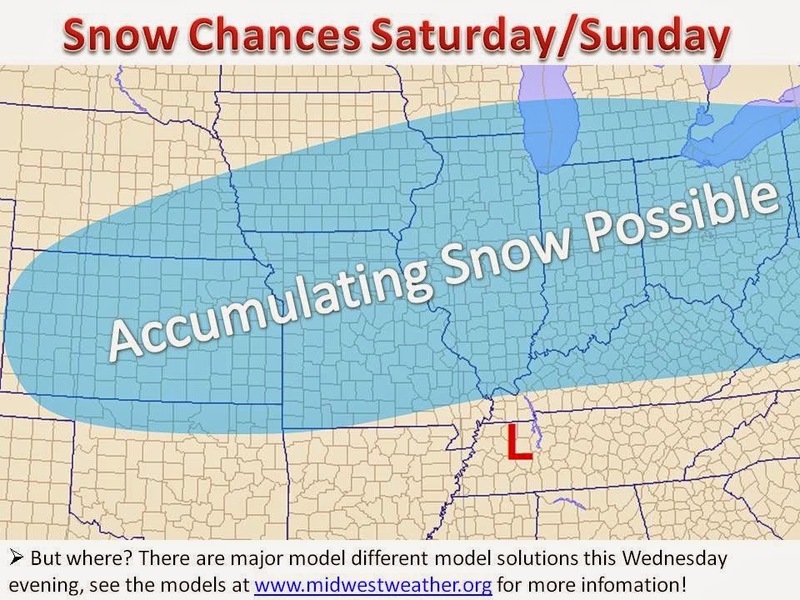 Here is our interpretation of the latest GFS model. Temperatures near the surface and aloft would allow for much of the precipitation to be mostly snow. The GFS is pinning a very wide area of 2"+ of snow with a narrow band of 4-7" through central Missouri and the Ohio River Valley. The storm would then cruise up the eastern seaboard and dump more snow in the same areas that saw 3 FEET of snow (All the totals here!) The solution does coincide well with previous runs a couple days ago. The NAM model is now on board with the GFS. It puts down similar amounts of snow but comes in even heavier, which is usually a rule of thumb with the NAM. It always overdoes snow totals 3+ days out from an event. Unfortunately, it only runs out to 84 hours, and it suspect to inaccuracies that far out anyways. 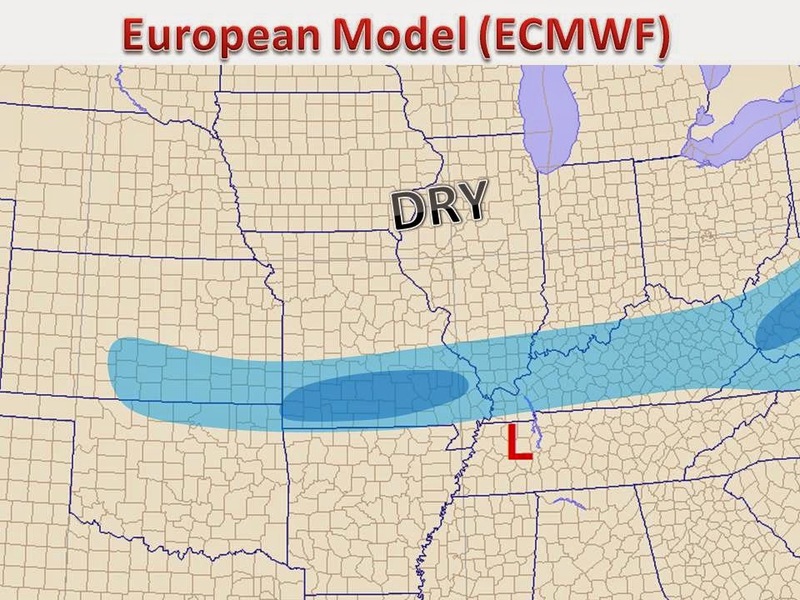 The model that forecasted the east coast storm first (Heard it hear first) the European is mapped for you. It shows the least amount of snow out of all the major models, but its track record of success cannot be ruled out. It only puts a narrow band of 2-4" down, and keeps locations that the GFS hammers completely dry. We will need to watch this system play out. It is still out over the Pacific Ocean, we will know so much more once this system crashes on shore later in the week and can become sample by the nation's weather network. The track and location of vorticity maxima will ultimately determine who sees the heaviest (if any) snow fall this time around. Either way, it will usher in colder weather next week.